Preheat oven to 350°. Combine bananas, apples, sugars and water. Stir in melted butter. In another bowl, whisk flour, baking soda, baking powder and salt. Stir into banana mixture. Transfer to a greased and floured 9x5-in. loaf pan. Bake until a toothpick inserted in center comes out clean, 50-60 minutes. Cool in pan 10 minutes before removing to a wire rack to cool completely. Meanwhile, toast coconut, stirring occasionally, in a shallow pan at 350° until golden brown, 4-6 minutes. Cool slightly. 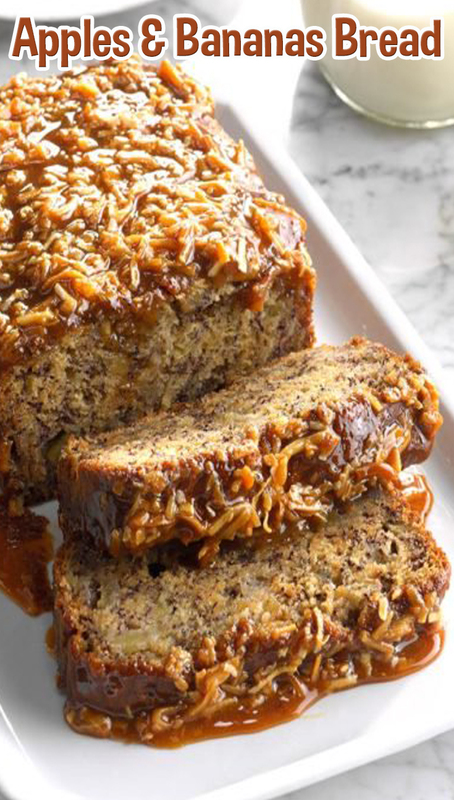 Mix coconut with caramel syrup and sea salt; spread over loaf.